Last growing season, Renee’s Garden offered me the chance to try a few free seed varieties. As a member of the Garden Writers Association, vendors of garden-related items occasionally send me free samples of their products, in the hopes that I will review them favorably. I was very happy with the results of the free seeds that Renee’s Garden sent me last year. You can read my reviews in Part 1 and Part 2. This year when I received my order form for free seeds, I decided to add a few vegetables to my Renee’s Garden trials. Today’s entry covers my results with these vegetable varieties. As you likely know if you’re reading here, vegetable gardening is the fastest growing area of interest for new gardeners. Analysts speculate that this interest is driven in part by folks who want access to high-quality vegetables at reasonable prices. Whatever the reason, I think it’s wonderful that more newbie gardeners are out in their yards playing in the dirt. I tried a beet variety, two carrots, a spinach, and a pepper mix. I always grow Red Ace beets, because they do well for me every year, and I like their sweet, robust flavor. As a comparison, I tried Red Baron from Renee’s Garden. Beets don’t really transplant well, so I always direct-sow them into the vegetable beds. Germination rates for the two varieties were both high; if anything, Red Baron did slightly better. Vigor of the plants also appeared to be nearly identical. In fact, if I hadn’t labeled my rows, it would have been easy to mix them up based only on top growth. However, differences in flavor readily distinguish Red Baron from Red Ace. This was not my best year for root crops. I think perhaps uncharacteristically heavy spring rains may have had something to do with this. Still, when it became clear that summer heat was asserting itself, root crop yields were respectable. Between Red Ace and Red Baron beets, Red Ace had a much sweeter flavor, but we found that we liked Red Baron too. Red Baron beets were earthier, more hearty, in flavor. I think they would be the basis of a delicious borscht. 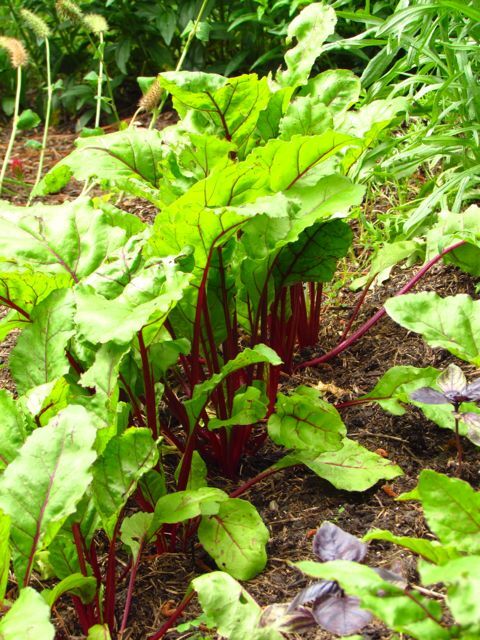 Red Ace beets are better suited to salads. I would grow Red Baron again. As you can see in the above photo, many of the carrots did not grow as optimally as I’d like. Most of what you see are the Renee’s Garden varieties. 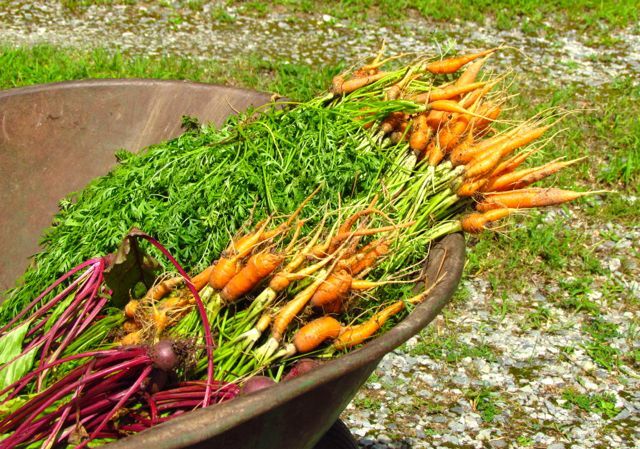 They grew more robustly than the several carrot varieties I tried from Johnny’s Selected Seeds, which surprised me. Johnny’s offers pelleted carrot seeds, which makes these tiny seeds easier to handle while planting. I am able to space the seeds in the row far enough apart that they don’t require much thinning as they grow. Renee’s Garden carrot seeds were not pelleted. I ended up doing major thinning to their rows. Interesting to me, Renee’s carrot seeds germinated at much higher rates than Johnny’s pelleted seeds, which is why I ended up with more of those varieties at harvest. I’ve never had such poor germination results with pelleted carrots before; I’m not sure why this happened. As for flavor, despite their less-than-lovely looks, these Nantes-type varieties were both tasty. Starica was sweeter than Rotild. The blurb about this Dutch spinach variety sold by Renee’s Garden states that it “stands up to early summer heat.” I’m thinking that Dutch and/or California (location of Renee’s Garden) early summer heat must be a pale imitation of North Carolina Piedmont early summer heat. Summer Perfection bolted fast and early for me, just as soon as our high temperatures hit 80 degrees Fahrenheit (i.e., late March). I grew this variety, along with all my other greens, beneath a canopy of spun garden cloth. The transplants went in before the last frost and were protected by the garden cloth. As temperatures rose, the garden cloth shaded the greens. I think this system (aided by phenomenal spring rains) kept some of the greens going into May — an unprecedented growing season for me! Summer Perfection leaves were delicious before they bolted, but the variety is probably not worth growing in my climate. They just don’t last long enough to provide a sufficient return on my investment in them. Every year, I grow a hybrid variety of Sweet Italian pepper called Carmen. Plants are consistently vigorous, overwhelmingly productive, and the scarlet fruits are reliably sweet, zinging the palate with a vitamin C tang. 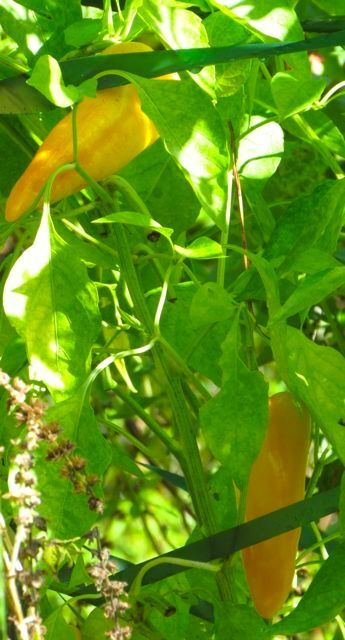 So when I saw that Renee was offering an heirloom mix of the pepper type from which Carmen is derived, I was curious, especially since I was promised plants with yellow or red fruits. I have a love-hate relationship with most heirloom plants. 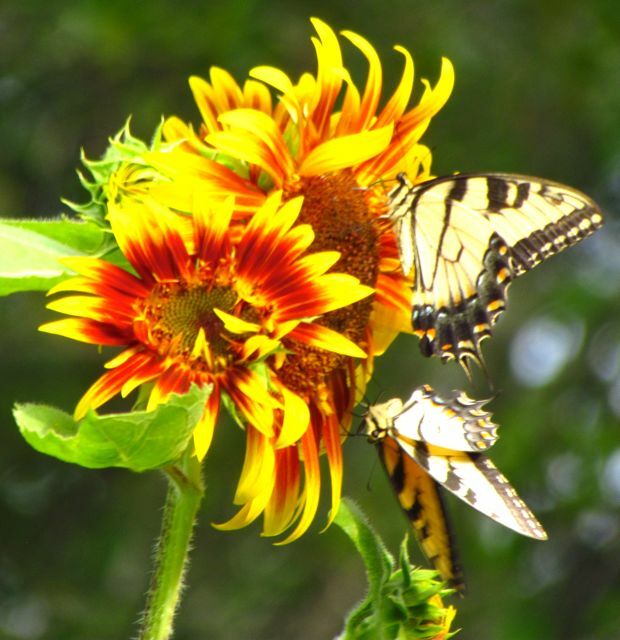 In the southeastern US where I garden, our fungal diseases and insect pests are numerous and often devastating, and our summers are usually brutally hot and frequently plagued by drought. Most heirloom varieties I’ve tried start out strongly, but soon succumb to the growing challenges of my region. I sow pepper and tomato seeds in my greenhouse and transplant them into their summer beds when growing conditions stabilize. Peppers especially don’t do well if you transplant them before nighttime temperatures stop dipping into the low 50s. The germination rate for Sunset Mix was about 60%. I routinely get 100% germination from Carmen seeds, and that was the case again this past spring. I attributed the difference to the hybrid vigor of Carmen and was not really surprised. Vigor of the transplants was good. Sunset Mix plants grew as tall as the Carmens. Each plant produced a fair amount of fruit, but not at the hybrid vigor levels of my Carmen plants. 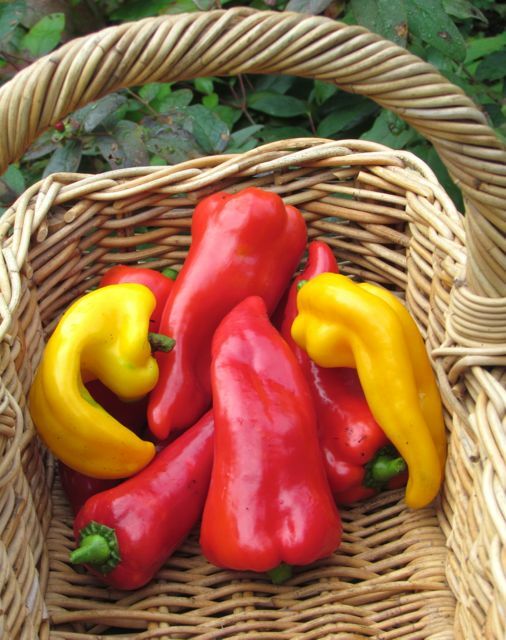 As you can see by the harvest basket photo above, Sunset Mix produced some nice-looking peppers. Their flavors were good, but had much more bite than Carmen fruits. I found that Sunset Mix peppers did not always please my digestive system, while the milder, sweeter Carmen fruits never bothered me. I donated most of the Sunset Mix fruits to friends and the local food bank, where they were much appreciated. I would not grow any of these varieties again, except perhaps the Red Baron beets. Even though the carrots were productive, they didn’t seem to appreciate my soil. I’ve had much better success with other carrot varieties. The spinach bolted so fast that I deem it to have been a waste of bed space. The peppers, although productive, just couldn’t match the flavor and productivity of my Carmen hybrid plants. Still, my garden is big enough to accommodate a few experiments, and I will continue to try a few varieties that intrigue me. I never know when I might stumble on a treasure worth adding to my list of essential varieties. Coming soon: Results of this year’s trials with Renee’s Garden flower seeds. Beet "Red Baron", Carrot "Rotild", Carrot "Starica", Renee's Garden seeds, Spinach "Summer Perfection", Sweet Italian Pepper "Sunset Mix"
This entry was posted on November 1, 2013, 1:18 pm and is filed under Greenhouse growing, piedmont gardening, Vegetable Gardening. You can follow any responses to this entry through RSS 2.0. You can skip to the end and leave a response. Pinging is currently not allowed.